I have finally started packing for my Thanksgiving weekend away. I usually need to think ahead to make sure I don’t forget to pack any essential. Since we’re going for a little bit longer than a weekend, I aiming to pack only the essentials needed for each day. 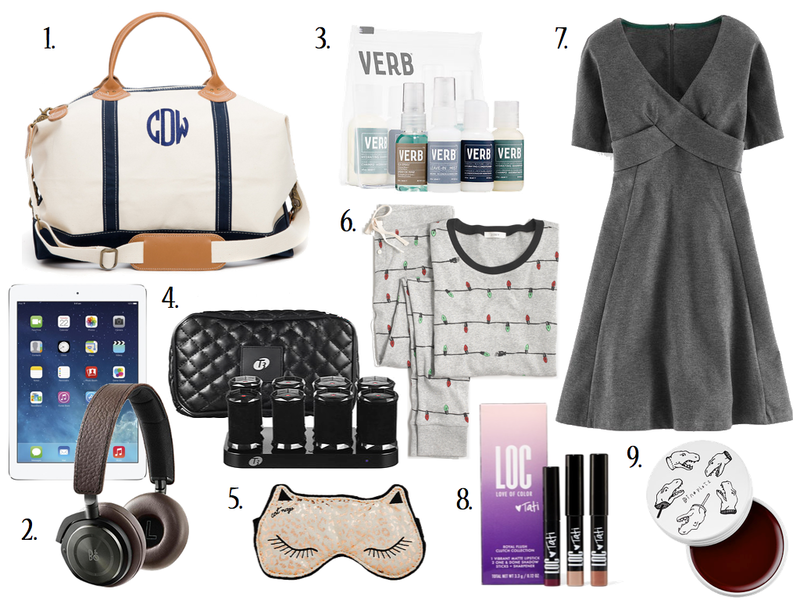 Check out all my absolute necessities for a Thanksgiving weekend away! 1. Weekend Bag: Even though it’s only a short trip, I still need a bag that’s big enough to carry everything I might need, which tends to be a lot of things so I end up needing a big bag. This sunshine satchel from Tuckernuck can actually pack a whole lot. It’s also has the added bonus of having the cutest monogram stitched on the side of the bag. 2. Noise Canceling Headphones: It’s going to be a bit of a long flight and I have A LOT of work that I need to get done before the holiday so, along with pre-buying wifi for the plane, I also made sure to secure a pair of active noise canceling headphones. These are seriously the best headphones I have ever had. I can’t believe I ever settled for the white iphone earbuds for long flights. I’m so ready to get a ton of work done so that I can be a bit more carefree and properly enjoy my vacation. I’m also making sure to download a ton of movies, tv shows and books on my iPad before we leave so I know that, even with poor wifi, I’ll always have something to entertain me. 3. Travel Friendly Haircare: I can never seem to get enough of tiny cute kits. Anything mini-sized and I basically HAVE to have it. This kit has everything I need to keep my hair healthy and shiny during my trip. It has both travel sized shampoo and conditioner, a leave in mist and even a sea salt spray to give myself some beachy waves. 4. Hot Rollers: I’m not a curler person. It’s just way too much time and effort for me to sit and hold each area of hair. I’m too antsy of a person to be able to do all that so when I want to go curly, I always opt for hot rollers. I just got these voluminous hair hot rollers from T3 and I’m already loving them. They’re compact enough that I can easily pack them in my travel bag. What I love the most is that they’re super easy to use so I can roll up my hair and let the rollers do their job while I finish my makeup or get dressed. 5. Eye Mask: I can have trouble sleeping when it’s not my own bed so I always make sure to bring an eye mask with me when I travel. It helps me keep my eyes closed and makes it a whole lot easier to sleep. Plus, the pattern on this one is just so cute! 6. Comfy Pajamas: I found these pajamas on J.Crew factory and I knew I already had to have them for the holidays. With a christmas light pattern, this two piece set with top and drawstring pants bottom will be super comfy to wear on Thanksgiving morning while I cook around the kitchen. 8. Eyeshadow and Lipstick Duo: For traveling, I always look for easy packable makeup products that can do double duty. I got a sample of this lipstick in the shade glam life in my latest birchbox and I loved the color. It was a deep berry shade and gave me some fun color for Fall. It made me want to try out their eyeshadow sticks. The videos make them look quick to apply and easy to blend, which makes it perfect for a quick makeup look before we put dinner on the table. 9. Tinted Lip Balm: For the plane and for quick color touch ups along the way, I’m packing this tinted lip balm from Too Cool for School in the shade spilled wine, which is a rich burgundy shade. It will be great for applying a touch of quick color before I get off the plane. Don’t want to look like a total mess when we touch down! What are you packing for Thanksgiving? Share with me in the comments below! Great list! The travel friendly hair care is a must. I can't go anywhere with out my favorite products in mini form. Oh my gosh I need those PJs in my life!! Great list! I LOVE this round up, such fantastic items! Great list. I love the weekender! I love the jammies. I have to go find them, they are adorables! I need to find those light bulb pajamas. So sweet.